During World War I (1914-1918), she helped her mother using X-ray technology in military hospitals. She helped train radiological workers. Curie then graduated from the Sorbonne in Paris. She earned a degree for work on radioactivity in polonium in 1925. Curie was born in Paris. Marie and Pierre Curie were her parents. In 1926, Curie married Frédéric Joliot-Curie, a French physical chemist. He joined Curie’s Radium Institute in 1925. In 1934, they discovered that they that could make stable elements radioactive. Curie and Joliot had a son and a daughter. Curie was also interested in social and intellectual advancement of women. In 1936, she became the Undersecretary of State for Scientific Research. Curie died on March 17th, 1956. ↑ 2.0 2.1 "Irène Joliot-Curie." Scientists: Their Lives and Works, UXL, 2006. Student Resources in Context, link.galegroup.com/apps/doc/K2641500109/SUIC?u=palo88030&xid=dacebfac. Accessed 28 Mar. 2017. 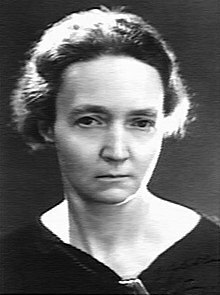 "Irène Joliot-Curie biography". Nobelprize.org. Retrieved 25 November 2012. This page was last changed on 28 February 2018, at 18:16.